Here at MacCullock's our qualified MOT tester can carry out your vehicle's annual MOT test. We can test most class 4 vehicles (cars and light commercial vehicles) in our dedicated MOT testing bay to ensure your vehicle is safe to drive and identify any defects rendering it unroadworthy. To book your vehicle in with us call on 01837 52776 or come in and see us. Your vehicle will first need an MOT once it is three years old and will then require one every year thereafter. How early can I get my MOT? You can present your vehicle for testing up to 30 days before your current MOT expires without losing any days from your certificate's validity. What if my MOT has already expired? If your vehicle does not have a valid MOT then it is illegal to drive it. There is an exception to this though; you can drive your car without an MOT but only to a garage where you have booked the vehicle in for a test. What if my car fails the test? If the necessary repairs are taken out on your vehicle without it leaving the garage where it is tested within ten working days you are eligible for a free partial retest (a fee of up to half the full test fee charged at the garage may be charged for the retest on certain failure items however at MacCullock's we do not charge any retest fees). If you do not get the necessary repairs carried out within ten working days you must present your vehicle for a full test at the normal fee once repaired. What if I've lost my certificate? 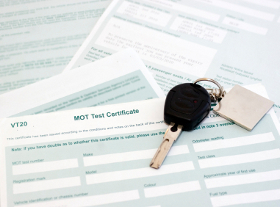 You do not need to have a paper certificate as your vehicle's MOT status is now recorded on the DVLA's computer system meaning all relevant organisations such as the police can tell your vehicle is tested without seeing your certificate. The paper certificate is issued as a receipt that a pass result has been recorded for your vehicle on the DVLA's database. It also informs you of any advisory issues that don't warrant a failure that have been identified in the test and shows your expiry date. If you have lost your certificate and want a copy you can get a duplicate from the test centre where the vehicle was tested, a fee of up to £10 may be charged for this.